Design your trip with our help! When is the hurricane season in Cuba? Officially from August till October. However a very big percentage occurs during the month of September and October. Do I have to share the shower in a casa particular? You have complete privacy when you stay in one of our casa particular. Therefore each room has its own shower/bathroom and "WC". What idoes not offer me Cuba4all Reizen? Cuba4all Reizen cannot help you with booking the flight or processing of visa, nor the renting of the car. Wat does it means: Cadeca? It is the official place to change your currency to local CUC, and in some of them you can even take money using your credit card. They are all over the place and are open from 9:00 AM until 4:00 PM, but don’t wait for the last minute if you need to make some change of currency since these places are quite flexible in the closing times. To change or withdraw money you will be asked for your passport. Where you should exchange your money to CUC? At the exchange houses Cadeca or at Banks? The “CADECA” applies the same exchange rate as the banks. Does it change all the CADECA at the same rate or should be better to change money at the CADECA at the aiport or at the CADECA in the city? Exchange rate is always the same at any “CADECA” you go except at the airport where is just a bit more expensive. Is it the same to change money at the CADECA as in the hotel? In the vast majority of the hotels in the country you can exchange money at the front desk, but the exchange rate is higher than in a “CADECA”, because it includes the commission of the hotel to provide this service, therefore if you want to save some money change it at any exchange house “CADECA”. Tour per oldtimer with driver? How does it work? Cuba4all Reizen is specialist organizing tours in oldtimer met driver. We first organize your trip based on your wishes and the driver will take you to the agreed places. His accommodation and meals are arranged by us. You do not have to worry about driving and finding the way around. Our driver is happy to help. Do I have to vaccinate if I want to go to Cuba. Which one should I use? To travel to Cuba there is no obligation in regards to vaccination. However it is always advisable to contact your doctor to find out more information. Is it easy to call from Cuba to other countries? In Cuba your mobile phone with roaming should work fine, however calls to or from Cuba are currently very expensive. Please check with your mobile provider the current costs. You can also use the land phones and buy prepaid cards that can be used at the local communication centers “ETECSA”, but remember that the costs are always high. If you want to make a call just dial the 119, then dial the country code + city code + the desired phone number. Do I have access to internet in Cuba? Is Cuba a safe country? Cuba is a safe country if you go on vacation. You can enjoy all it has to offer at any time of day or night and in any place without fear that something could happen to you. If at any time you find yourself lost, you can always count on the local people that will always help you. I would venture to say that Cuba is the safest country in the whole region of the Caribbean. However it’s always good to have caution. Make a copy of your passport and never go with the original passport. Leave the original always at home (hotel or casa particular), don’t wear expensive things that can attract much attention or clothing of high value. In the rare case of finding yourself in trouble, you can bring your complain to any police officer. In Cuba the tourist is very well protected by the Cuban government and if anyone wants to trick you or harm you will be taking a very big risk if you complain. Is it safe to drink water in Cuba? Yes, as long it is bottled water. It is not recommended to drink tap water. Which dates are officially holiday in Cuba? During the official holidays in Cuba many places are closed. However in most of the tourist areas that does not happen and many facilities remain open. The museums, shops and banks are closed, but the restaurants, car rental houses and night clubs are open. January 1: Triumph of the Revolution. January 2: New year holiday. 5, 26 and July 27: Days related to revolutionary fights. October 10: The day the freedom to the slaves was given. December 31: Old year evening. Is it recommended to drive in Cuba? The quality of the roads in Cuba are different depending on where you are, especially outside of the cities you will find the road in poor condition or with low lights. This is why I recommend you try always to drive during daylight. Another thing to bear in mind is that you might find wild animals on the road, bicycles or pedestrians, so you must drive with great caution. Police in Cuba is very strict in regards to traffic violations, so I would recommend you to respect the signs to the maximum. Don’t wait until the last moment to fill out the fuel tank, because the distances between a stations can be longer than expected. Reduce the speed as soon as you see a sign stating “Punto de Control” “Checking Point”. Here police is checking for documentation and speeding. The roads in Cuba do not have many traffic and motorways have a maximum speed of 100 km/h. What is the official language in Cuba? The official language is Spanish although today many people, especially the young people, speak a foreign language, mainly English. Which is the favorite Cuban sport? For many years baseball has been the favorite sport for Cubans, however recently soccer is taking more and more fans. What does Cuba4all Reizen offer? 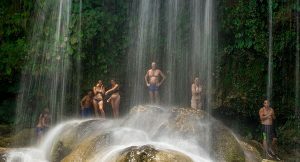 Cuba4all Reizen organizes all kind of activities you would like to take while you are in Cuba such as excursions, short programs, tours, accommodations, meals, etc. The flight ticket must be arranged and purchased by yourself. How can I go from one place to another one in Cuba? You can rent a car. This is probably the most flexible option and it can give you more freedom to move at your own pace, but it is also the most expensive one. You can use public transport “Viazul” coaches with air conditioning and good comfort. They will take you from one city to another. Official Taxis linked to the company “CUBATAXI”, which you can use to move inside the cities. They generally operate with taximeter and the prices are a bit high. Private taxis. They are usually old cars, most Americans and Russians and you can negotiate the price of your destination with the owner in advance. In the cities you can use “Coco-Taxis”, motorcycles of 3 wheels in the shape of a coconut or the “Bici-Taxis”, bicycles adapted to 3 wheels, which are daily used by the Cubans to jump from one site to another. This means of transport must be paid in local currency CUP. What kind of cloth should I wear in Cuba? Cuba has a subtropical climate throughout the year with average temperatures of 25 degrees celsius. It has approximately 300 days of sunshine during the year. It is recommended that you use light summer clothes, preferably cotton or wool. In the months of December to February (winter months) the temperature tends to go a little bit down during the day, but at nights and due to the humidity, you could feel a bit colder, detail to take into consideration and to carry a coat if you have plans to take a walk. Keep in mind that the minimum temperatures in winter go from 15 to 20 degrees celsius. What is the best tome to visit Cuba? You can visit Cuba any time of the year. However it is good to know that during the months of September, October and November the island is exposed to tropical storms or hurricanes, being the month of October the wettest month and July and August the hottest months of the year, with maximum temperatures of approximately 35 degrees. It is advisable to use suncream, wear sunglasses, and use repellent to mosquitoes. It is mandatory to travel with a travel insurance. The insurance most be issued with a company that is recognized by the Cuban government. The travel insurance should cover all medical costs that you could incur during your holiday in Cuba. The policy should say which medical costs are covered during your holiday in Cuba, together with the policy number, your name and the name of the insurance company. Can I get money from an ATM or a Bank using a VISA or MASTERCARD credit card? Yes, the ATMs accept both cards. Salsa holiday to Cuba with lot of dance lessons. Photography Tour to Cuba with special photography workshops. Call us. We are at your service! Thema Tours: Photography, Dance, Diving, Children, etc. Value for money. All your trip at beneficial prices.